I just got back from the Ron Greschner Foundation's 7th Annual Golf Classic and what a great time it was! I got to meet and play golf with some wonderful people, as well as see some old teammates & legendary Rangers such as: Rod Gilbert, Vic Hadfield, Gilles Villemure, Chris "Knuckles" Nilan, Mike Backman (His son Sean is a star at Yale), and of course Ron Greschner. 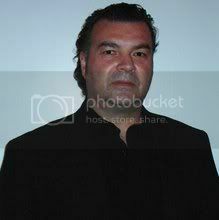 Also in attendence was former NY Giants Linebacker Karl Nelson, actors Aiden Quinn and Joseph Gannascoli (He played Vito Spatafore in the Sopranos). All in all, it was a fantastic day (Although it was steaming hot)! The people who attended put up some considerable amounts of money to play in this outing and to help out autism research and awareness. I'd also like to thank the man behind it all, Pete DeStefano - and the DeStefano family for the great time I had. If there was anyone who I missed, my apologies. I'm going to put up the foundation's website once again down below so you all can take a look and check it out, after all - it's a great cause. Now, the wonderful and insightful Rangers fans were heavy in attendence and it was interesting to sit back at dinner listening to their views on the team. The majority I talked to were still scratching their heads over Sean Avery's departure (about 75% of the people). Jagr's departure was about 50/50 as to those who wanted him to stay and wanted him to go. Overall you could feel the passion and excitement in their voices in looking forward to next season. 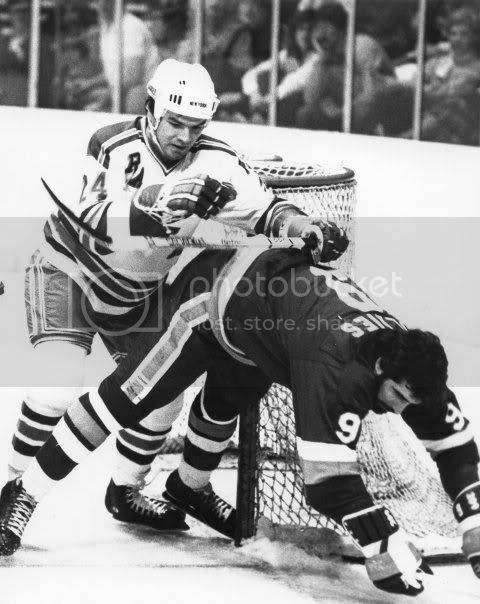 Everyone was also in agreement that Ron Greschner's jersey deserves its rightful place among the Ranger gods (I agree as well)! Hopefully sometime in the near future this will happen... it must happen! 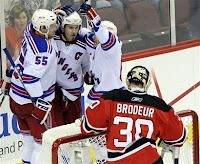 Oh, and one last thing, does anyone remember who was the first to crack 50 goals as a New York Ranger? I know I do. Well, over and out! It's been 10 days since my last posting and I'm basically bored. 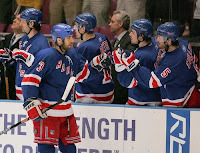 I can't wait for hockey to begin with the "new look" Rangers (and I really mean new look... read further on). Soon, the season will start and the boredom will end. A couple of weeks ago I was watching the NHL Network (It's about time we had a channel dedicated to hockey) and the New York Rangers were on. The game that was on TV was the 4th and final game of the 2006-2007 playoffs against the Atlanta Thrashers. 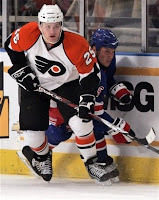 I was at that game and I remember Jaromir Jagr putting the icing on the cake with an empty netter. But, what struck me most was the players who congratulated him: Marcel Hossa, Michael Nylander, Marek Malik, and Michal Rozsival - all of which are goners (except Rozsival), including Jagr. I did a little digging and checked the 2006-2007 opening night roster, as well as the 2007-2008 opening night roster, and then finally got to where the Rangers roster will be in 2008-2009 (Only the Shadow knows!). Talk about a quick, but under the radar, transformation! The Rangers have definitely changed the core of this team from 2 full seasons ago. There are currently only 4 skaters (not including goalies) on the roster that were in the line-up opening night 2 years ago! Those skaters were Nigel Dawes, Petr Prucha, Blair Betts, and Michal Rozsival. Last season's line-up on opening night has 11 skaters that are still on the roster (again, not including goaltenders). This upcoming season's opening night roster is going to be interesting. Gone from last year's roster are Jagr, Straka, Avery, Hollweg, Tyutin, Malik, and maybe even Shanahan. There will be plenty of jobs to be won or lost in training camp & preseason. I know I was a believer in tweaking this team, however I have to admit they got younger and faster. I will give it up for Glen Sather, the Rangers could not get out of the 2nd round 2 years in a row - so it was time to change it up. Out with the old and in with the new! The only problem I see is chemistry (Much like last years squad early on). Also, familiarity could be an issue as well. This process might take months, half a season, I really don't know. One thing is for sure, there will be a new look for the New York Rangers. With Free Agency down to a simmer and some teams holding their breath over Mats Sundin's decision whether to play or not (Take your time Mats, it's all about you), I look at this year's FA period with shock, excitement, and some huge "are you kidding me?" thoughts. The shocks to me are Marian Hossa turning down multi-million dollar deals for a 1 year deal with the defending Stanley Cup Champion Detroit Red Wings. This one smells a little... some verbal agreement must be in place or this one doesn't pass the laugh test. Brian Campbell's deal with Chicago, simply a "wow" is needed (he's gonna have to live up to it). 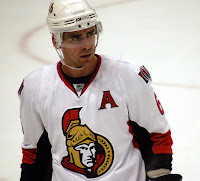 Wade Redden's 6.5 Million a year deal with the Rangers opened up some eyes - big time. He's going to have to regain his earlier form of hockey, rather than his latest (that whole team in Ottawa took a quick downward spiral last year). I hope the change of scenery will help him, but he's gotta live up to his deal - just like Campbell! There's plenty more around the league we could discuss, digest, and debate - but one thing's for sure: the NHL's top money teams: spent and the weaker teams (financially): did not. This is bothersome to me. A gap of 16.5 Million Dollars between the "haves" and the "have nots" is huge in the NHL. If the weaker teams don't spend to the max, how can you expect the fan base to support them? What you are saying is, come spend your hard earned money and we'll give you a 2nd rate product. I sometimes wonder how they're going to sell the game of hockey better in America, I don't have all the answers... I wish I did, but one thing is for sure - the money spent this year in Free Agency was enormous by the financially sound teams. This is the same league that shut it down 4 years ago, isn't it? The league in general, plus owners, probably did a good thing then by trying to keep the spending down and give every team even footing. Wasn't that the goal of the lockout? 4 years later, the money has magically appeared and the spending is reaching that critical point, is it not? Some teams are not on even footing and let's face it - some are in quicksand. *Pictures in all blog posts are taken from Yahoo! Sports & Getty Images, also Google images. Wow! That's what I'm thinking right now. The NHL's free agency period began with an astounding 300+ million dollars being spent (Also, may be more by the time this is posted). Is this the same pro sports league that not long ago cried like little babies over the finances of the NHL and where it was going? We gotta change this! We must change this! 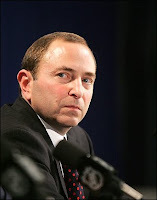 Apparently the NHL is doing just fine when it comes to doling out the "loot" for this years free agent crop. The crop was led by Brian Campbell's signing in Chicago (8 Years, 57+ Million), Michal Rozsival (4 years, 20 million to stay in blue), and a real odd one - Marion Hossa signing a 1 year deal with the Detroit Red Wings for 7.4 million dollars (this is a head scratcher). This one really hurts though... Sean Avery has agreed to a 4 years 15.5 million dollar deal to play in Dallas. 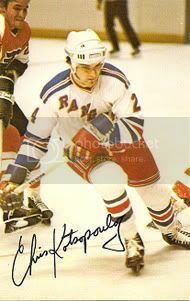 I wish he would of re-signed with the Rangers, but it takes 2 to agree on terms and obviously it didn't work out. I'll miss his presence on the Rangers next year. He would of helped greatly, but as a fan you must move on. 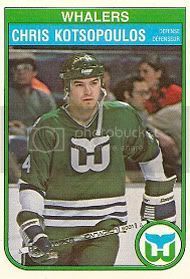 As for Jaromir Jagr, who knows? I for one want him back in the Ranger fold - big time. I hear Jagr's "waiting for a signal". What signal? The bat signal? What signal does he want? If he doesn't realize by now, the Rangers, the city, and the majority of the fans are in his corner and would gladly welcome him back immediately (like yesterday)! As for the signal... 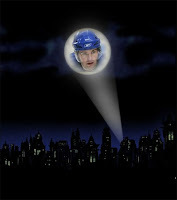 I'm sure Commissioner Gordon... oops, I mean Sather has expressed to Jagr that he's wanted back. The ball is in your court, Jaromir. Don't drop it. On to the next order of business, the re-signing of Rozsival might have some people in an uproar and some not. Rozsival was the Rangers leading point getter - defenseman wise - and the going rate for an offensive defenseman was set by Brian Campbell's contract. Sometimes you got to pay, sometimes you don't. In this case - you had to pay. Now, the Wade Redden story is almost the same as Rozsival's. Even though his game has fallen lately, the market basically said he's a 6.5 million dollar player. I say the jury will still be out in many of these signings by the NHL and the Rangers, only time will tell if these moves were the right ones or not. 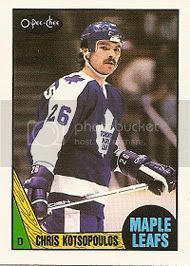 Oh, and by the way, the re-signing of Steve Valliquette was a good move. He's capable when called upon and is a very good team guy. As for Rissmiller, Jamtin, and Voros... it's their opportunity to take advantage of Avery's departure and fill a void (a big one)! Check back soon, it's not over til it's over! I will also post some updates as certain signings or trades happen. Update: Orpik was re-signed by the Penguins apparently for 5 years, 22 million dollars. That's a shame. Would of liked to see him on the Rangers for sure. The initial reports on this were for 4.5 million a year, that would of been far too much for Oprik in my opinion. Update: The Rangers traded Fedor Tyutin and Christian Backman to the Columbus Blue Jackets for Nikolai Zherdev and Dan Fritsche. I like the move for the Rangers. Not only do they gain some cap space in the deal, but they aquire a much needed young winger. Maybe they pair Zherdev with Gomez? That remains to be seen. except the Jagr picture. Update: Rangers sign Markus Naslund and Dmitri Kalinin. 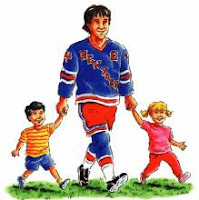 It also appears Jaromir Jagr will not be returning due to comments made by Glen Sather. Thoughts on this later.